Then I Got To Thinking...: Happy Father's Day, Dad! I have the world's most amazing dad. My dad is the most giving, hard working, creative human being I know. Let me just explain... my dad has been a firefighter for more than 30 years. He started at the department as a volunteer while he was in high school, and never left. He worked his way through the ranks and has given his career 100 percent, every. single. day. He loves his job. My dad is a pilot - my earliest memories with my dad are in his small airplane. I would sit in the co-pilot seat (in my car seat) and sing my ABC's to him. He is a father of 3 girls - and now has one grandson. We've always been my dad's first priority. He is the kind of dad that I can call if something is wrong... and as soon as he can he will be there to rescue me. He came all the way to San Francisco in the middle of the night to bring me another car after mine had broken down. He would do anything in the world for me and the people in his life - and we've known it forever. My dad is a dress-maker. He made both of my sisters & my senior ball dresses. They were unique and amazing -- and so dang special. And they had matching purses! 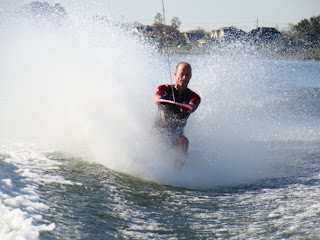 He has been a water-skiier his entire life. He barefoots (basically skies with out skies), he can wakeboard, air chair - he can do anything he puts his mind to... he is so athletic. My dad is a whole hearted philanthropist and community man - president of the Lion's club in our hometown, sits on the Elk Grove Community Foundation Board, donates money to start scholarships, gives all of his time to his friends who need help - you ask, you get (most of the time you don't even have to ask)... with out a single complaint. He was the PTSA president at my high school (and my sisters) for 8 years - he went to every single school dance and ran the snack bar to raise money so our student body could have events. He is SELFLESS - he did none of this for recognition. He is the guy in the neighborhood who puts Christmas lights on and off of the houses for the people who can't do it themselves. He has taught me so much. To help for nothing in return, to love people even if they are different, to WORK HARD - everyday, to honor others before yourself.... most importantly to GIVE. Give your time, your money, your kindness. He is a father to not only me, but to TL... who appreciates it more than you can imagine. I am so proud to be his daughter. This is so sweet! You're so lucky to have such a wonderful Father!! Happy Fathers Day to him! What a wonderful post Tracy ~ and he sounds like a wonderful man! You are so lucky to have him. Never take your time for granted ~ cherish every moment. This is so, so sweet. Your father sounds like such an incredible man and you should definitelyyy show him this sweet post, I bet it would make him cry. Seriously, the sweetest thing ever. And, that is amazing that your dad can make dresses! :) Definitely post up pictures! Aww, I just got the chills. That was so sweet and touching to read. Thanks! Fathers are the best. I'm super thankful for mine too. Happy Father's Day to your Dad !!! p.s. This should be put in a frame and given to him, it's solely BEAUTIFUL!!! Happy Fathers Day to your Dad Tracy. Lovely tribute to him. My grandfather was a career fireman in Sydney too too many years ago. He also was my hero. Coincidently I just found some old photos of him last night in his old brass firemans helmut (your dad will know what i mean). Thanks for visiting me at my blog and your lovely comments. I hope to get to know Simone (and you too) better in the future. What an awesome post to honor your Dad on his special day! This was just beautiful Tracy, it made me tearful! How lovely to have such a wonderful and inspiring Dad.....and I loved that he made your ball dresses....I bet most people are speechless at that!! My dad's the father of three girls too :). It's a rough life lol. What an amazing post for your dad! Just found your blog today...it's adorable! I'll have to check your you sisters too! What a wonderful tribute to your dad. He sounds like an amazing man! Wow! Your dad sounds amazing! And I'm sure he's lucky to have you as a daughter! I like your blog, have a nice week! WOW! i can't believe he can do SO MANY things. he made your dresses? he's a firefighter.. a pilot... list goes on! p.s. would love you to enter my giveaway! Tracy- what a beautiful post about your Dad! I love this!